Goodness gracious, you will think, will this woman ever shut up about social media? Anyway, this one is actually going to be fun. Because who doesn’t love to read? 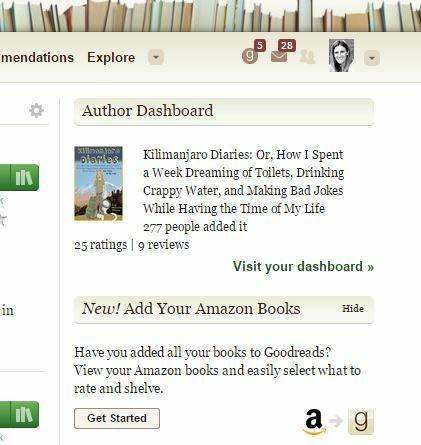 Goodreads, as the name suggests, is the social media site for readers. The Facebook for people who love to read. Lots and lots of readers congregate there, and what better place to establish yourself as an author than among serious readers? If you like to read yourself – as most writers seem to do – you will love Goodreads. I’ve made a habit of rating (and leaving a review) for every book I read or listen to as an audiobook. Every. Last. One. It’s a bit time consuming, but it gives me a great booklist right at my fingertips. It’s like your very own book club without the need to prepare any hors d’oeuvres or do the dishes. But of course we’re not here today because of books we read. We want to establish ourselves as authors on Goodreads, so that others who go there to read can find our books and hopefully leave a helpful review and rating for other readers. It’s like Amazon reviews in that respect, except Goodreads people seem a little bit more willing to leave reviews and perhaps recommend your book to others. If they like it, of course. Note that I try to keep my profile fairly consistent across all social media platforms. One, it’s easier to use and maintain the same picture, and two, it makes it look professional. Regarding the bio, I keep a Word file with several bios for various uses: A very short one to go under magazine or online articles I write, a medium-length one like the one at the end of my book and on my Amazon profile, and a longer one like this one on Goodreads, all of which I seem to be tweaking every once in a while. Once people start reading your book, your dashboard will show you some quick stats, like how many people have added your book to their to-read shelf, how many ratings it has received, and how many people have reviewed it. But first you have to add your book to your profile. Click where it says “add your Amazon books.” (You can also add your Smashword books, but I’m not touching on Smashwords in this series). I’m not sure exactly how this works, because this feature didn’t exist when I added my first book. I had to first get it onto Goodreads by asking a librarian to add it. If you ever have any questions about anything, you can email one of the librarians there and get a fast and friendly response. Anyway, adding your book via Amazon should be very straightforward. 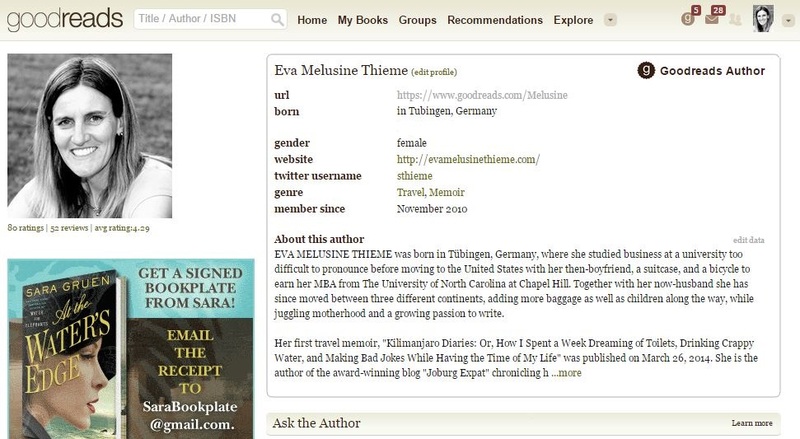 You may need to wait a little bit once you’ve added it so that you can be verified as the author by Goodreads. 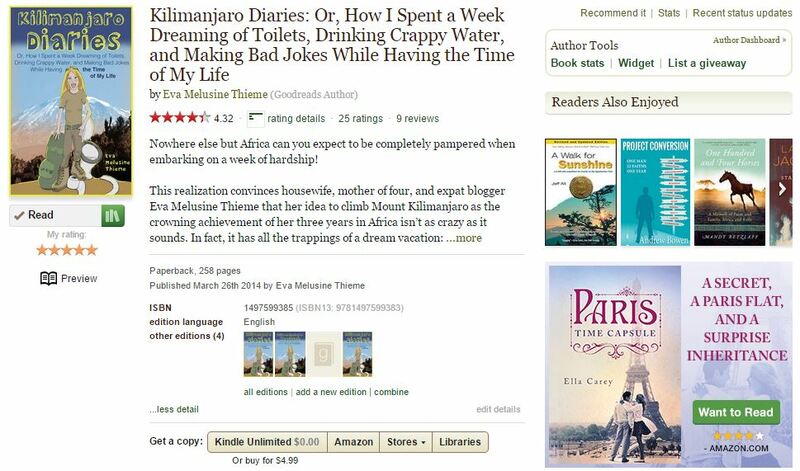 This is what any Goodreads user gets to see about your book. Note the “preview” button under the image? That gets linked to your Amazon “Look Inside” function. Or you can add your own PDF preview file here, if you prefer. But I like having it linked to Amazon, because you may edit your book file down the road, and the fewer different versions you have floating around, the easier. You will note that the above is the listing for my paperback edition. See how it says “other editions (4)” at the bottom? In my case, these are the Kindle version of my English book as well as both paperback and Kindle editions of the German translation. You can add new editions where it says “add a new edition,” and you can also combine your editions. I strongly encourage you to take advantage of this feature. You really don’t want different unlinked editions of your work floating around. Why not, you might ask? The answer is easy: You want as many reviews and ratings as possible, as this will help your visibility and ranking, just like on Amazon. If each edition is ranked and rated separately, it’s harder for readers to access all reviews of your books in one place. This has been a bit of a long post but I think it’s very well worth spending some time figuring out Goodreads. As with all social media, you have to work it, i.e. add friends, follow and comment on their reviews, and rate and review books by other authors. If, like me, you love to read, this shouldn’t be too much of a burden. In fact, being able to tell myself that “reading books” actually counts as “work” has been one of my biggest perks as a freshly-minted author. Goodreads has some other great features, like letting you run Giveaways to readers, which is an awesome way to increase your exposure. I’ll talk about that in more detail in an upcoming post. View the entire Book Launch Checklist here. Good post. For some reason, I hadn’t thought much about Goodreads. I’ll be sure to add it to my social media platform. Thanks Lynette. I too hadn’t thought much about Goodreads early on. Became a member but didn’t do much there, but discovered that most serious readers seem to be on there. And I do like their giveaways.